We have a bit of an ant problem in the garden, well in the backyard in general. I hate just grabbing the nearest pesticide and spraying the whole backyard… including the garden. We are trying to be organic here! So in the past week or so we have been searching the “intra-webs” for the organic answer to ant control and have found some quite interesting ways to get rid of ants. All of these are organic, so if you are looking for the same thing – read on below. 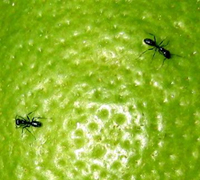 The tips below should keep ants from having a party on your plants.